HOME PRODUCTS &AMP; SERVICES DIRECTORY OF SUPPLIERS INDUSTRIAL PC, INC.
Industrial PC is a leading provider of customizable, high-performance embedded computers, industrial motherboards, rackmount computers, touchscreen displays, and panel PCs that are engineered for the most demanding environments. For over 20 years, our experts have worked with top companies in some of the most demanding of industries including military, aerospace, heavy equipment, amusement parks and industrial automation. We deliver peace of mind to our customers by providing rugged computer solutions that can stand the test of time and the toughest elements. Headquartered in Indianapolis, our team of experienced and trusted experts is dedicated to providing our clients throughout the world with a host of state-of-the-art industrial computer solutions to meet their precise needs. 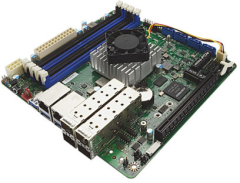 Whether you are seeking a fanless embedded computer system, rugged touchscreen technology, high-performance industrial motherboards, or a reliable all-in-one PC solution for a harsh environment, you can rely on Industrial PC to deliver. Network hardware and software used to manage digital communications technologies, and the latest in LAN's and WAN's. Look for your first issue of the Networking & Communications newsletter to arrive soon. View More Product Announcements from Industrial PC, Inc.